Danielle Daws: JAI50 - Another Tricky One! Time for another Just Add Ink Colour Challenge. I found this one really tricky, although the colours look great together. Lately, when I'm having difficulty pulling something together, I find using an additional challenge helps. 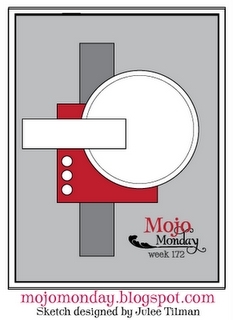 So for this one I've used the sketch for Mojo Monday 172. Hi Danielle...just wanted to say I really like the card! It may not be your usual style, but it is still amazing as are all your other cards! Love that colour combo. I agree Danielle sometimes it is often difficult to start with say just a colour challenge but by putting it together with a sketch challenge then off you go and create something as unique as you always do - love the elements you have put together here. Danielle Daws!!! I'm rousing on you!!! (see most scariest mother tone voice!) Your card is beautiful as are all your cards!!!! You are loved as is your gorgeous work! So. There. LOL. Not your usual style, but there's nothing wrong with changing styles when called for - you've done a great job and it's a lovely, bright card. Ummmm yes....you definitely do have your own style. 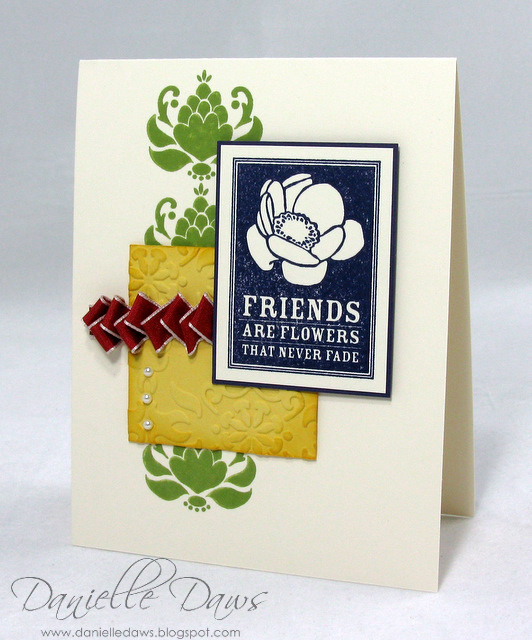 I love this card - the ribbon is awesome. I just love the abstract type layout. Cool colours man. I really like this one. The layout is great. You make the colours look so easy!! You did such a great job with these colors! I love all the texture you've added and I love all the clean open space!